The Solomon R. Guggenheim Museum, often referred to as The Guggenheim, is an art museum with permanent home of a continuously expanding collection of Impressionist, Post-Impressionist, early Modern and contemporary art and also features special exhibitions throughout the year. 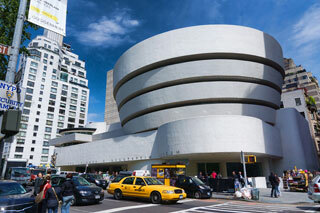 The museum was established by the Solomon R. Guggenheim Foundation in 1939 as the Museum of Non-Objective Painting, under the guidance of its first director, the artist Hilla von Rebay. This article uses material from the Wikipedia article "Solomon R. Guggenheim Museum ", which is released under the Creative Commons Attribution-Share-Alike 3.0 License.